I’m sure most of us have memories of our parents nagging at us to not waste a single grain of rice as we reluctantly stuff ourselves with the seemingly oversized bowl of rice. But your parents do have a point, food wastage in Singapore is at an all-time high! Singaporeans generated over 750,000 tonnes of food waste in just one year. The carbon footprint of food produced and not eaten globally is estimated at 3.3 billion tons of greenhouse gases. Little did you know, Mui Fan can be the answer. Get ready to learn about a way to deal with your unfinished rice and stop your parents from nagging at you! 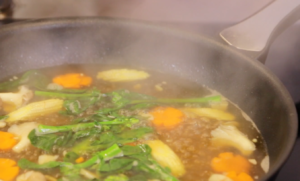 Because Eric Teo has a recipe to change your leftover rice and available ingredients to a delicious home cooked meal! 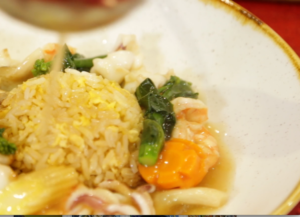 This recipe is Chef Eric Teo’s Seafood Mui Fan! Astonish your family and friends by transforming your plain leftover rice to a flavorful Mui Fan that can compare with your local Tze Char Store! 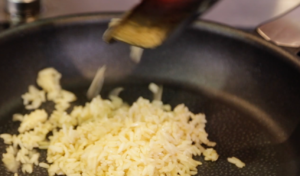 So stop wasting your rice and get cooking! 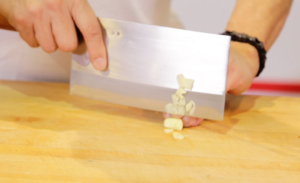 Using your knuckles as a guide, to cut thin slices of garlic. You can start boiling the water in the wok while you are doing so. Cut your vegetables into small pieces like the image below. 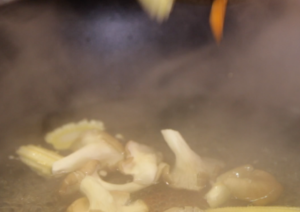 Chef Eric used Mushroom, Baby Corn, Carrot, and Choysum. Place your vegetables in the boiling water to blanch it. Add sugar to your liking to give the vegetables enhanced color, and add salt to your liking for added taste. After 2-3 mins take the vegetables out with a stieve, and place it on a separate plate. 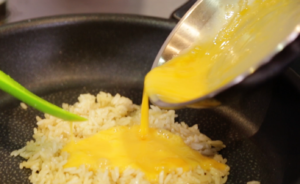 Pour the whisked egg on top of the rice and scramble it thoroughly throughout the rice for approx. 2 mins. Fry till its 30% dry but not completely solidified. Add some pepper to your preference. Scrap the rice to a separate bowl when finished. First add one to two tablespoons of oil, then stir-fry the garlic till fragrant. Add three tablespoons of Hua Diao Wine, Add water till it just covers the surface of the pan, Pour chicken stock to 1/3 of the frying wok’s height. Add four tablespoons of Oyster Sauce. 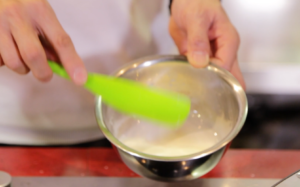 Stir a tablespoon of Tapioca Flour with water, while the “gravy” is boiling. Pour it in when it starts boiling. This will give the gravy more consistency. 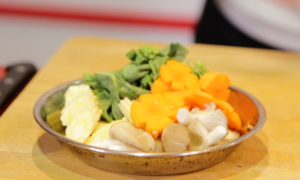 Pop the vegetables and seafood into the wok and mix for 1 to 2 mins. Voila! 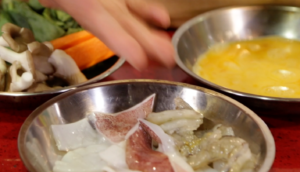 Your very own seafood muifan! First place the fried rice in the plate. Then pour the gravy from the wok into the plate. There you have it! 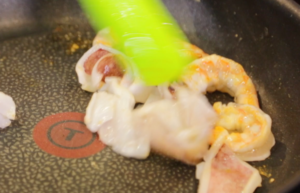 Your own home cooked Seafood Mui Fan with less waste with more flavor! Can it be compared to your local Tze Char Restaurant? Let us know in the comments below! Previous articleSamut Songkhram – the smallest Thai province with the biggest of hearts!